Known for its wineries in the area, Montgomery County is part of the region known as the Missouri Rhineland, so called for its similarities to the area in Germany of the same name. Birth records dated from 1920 to the present, and death records from 1980 to the present are both available at the Montgomery County Health Department at 400 Salisbury in Montgomery City. Those individuals who need records outside the scope of years available at the local health department will need to contact the Bureau of Vital Records in Jefferson City. 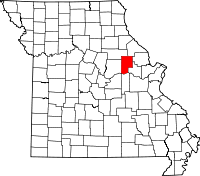 The application provided on the county department's website can be physically turned in there, or mailed into the Bureau at Bureau of Vital Records, Missouri Department of Health and Senior Services, P.O. Box 570, Jefferson City, MO, 65102; in either case, the application must be notarized prior to submission.